Outside of the High Town, West Row is the largest of the Mildenhall settlements. These hamlets were hotbeds of non-conformity, and West Row had a Methodist church and a Baptist church. 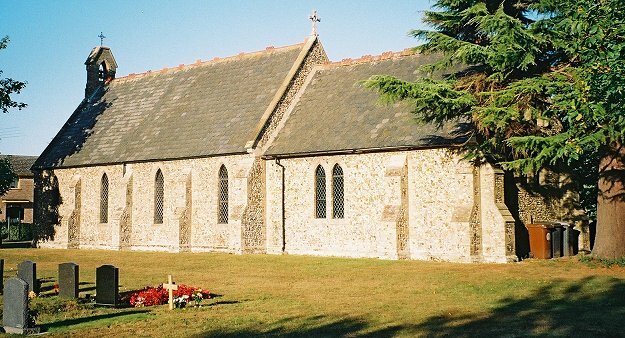 The few Anglicans had to go all the way into Mildenhall to attend divine service at St Mary, so in 1875 the village school was extended and converted into a church. The school had been built 25 years earlier as a National School, but soon turned out to be too small. It constituted the nave of the new building. Nowadays, it is hard to see the difference in age. Triple lancets were put in at both ends, those at the west end being a bit grander than those at the east. 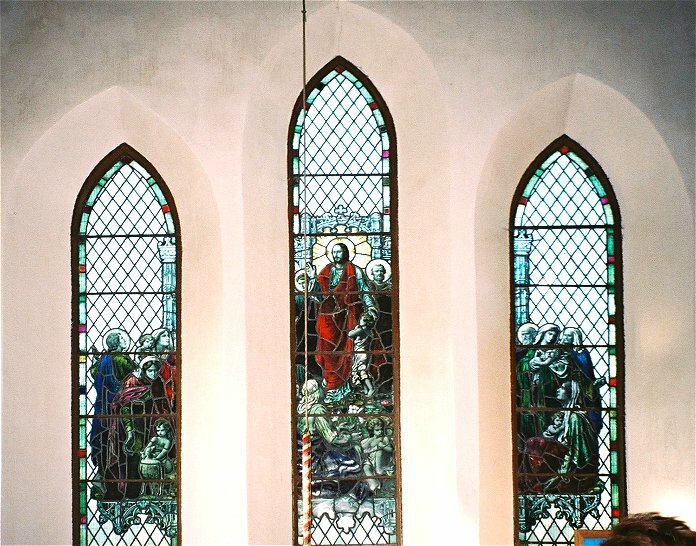 The west end ones contain a fine window which deserves to be better known; it remembers the son of a curate who died saving someone from drowning. 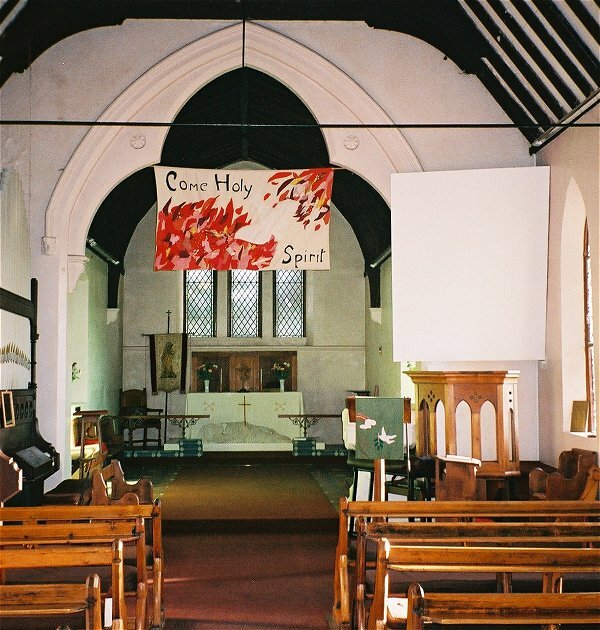 Facing east, a hand-made banner reads 'Come Holy Spirit! ', an echo of the one at nearby St Mary. The benches are very simple. Curiously, they are identical to the ones recently replaced at Barton Mills on the other side of the town centre. West Row could be a pretty village; unlike the other three of Mildenhall's outposts, it has some fine old houses, and the roads even curve a bit. But the pressure of the American presence is simply too much. 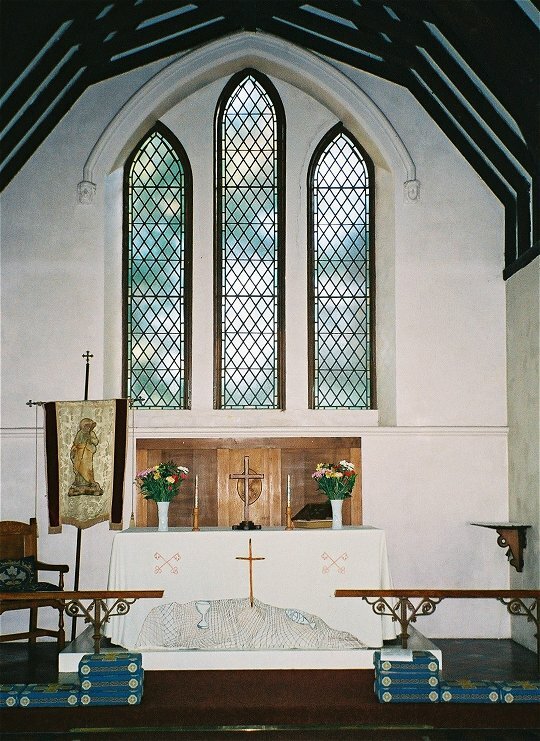 The infrastructure of the parish buckles under the weight of providing their services. The traffic is awful, and the village green has found a new role as a container depot. In addition, the village is home to the Fen Tigers speedway team, and has long since failed to resemble anything other than a rather grim suburb. Unusually for a Victorian church there is a graveyard. On the other side of the air base you'll find the same thing at Beck Row. Non-conformism still thrives in West Row; there is a busy modern baptist church nearer to the village centre. This may also explain the low church character of St Peter. But in any case the local Anglicans are to be congratulated on keeping most of their churches open. St Peter, West Row, is to the south of this large settlement, on the road to Worlington. Alternatively, you can find it by cutting south from the airbase's southern perimeter road.